Enter a world of challenging fun and sweet graphics! Do you have what it takes to get through THREE AWESOME LEVELS of platforms, puzzles, and pests? 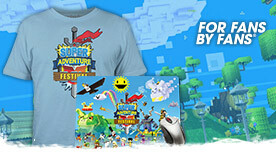 Open the Super Adventure Box and find out! From April 1-30, 2013. Learn more about the valiant norn Braham in this short story by Guild Wars 2 writer Angel McCoy. Stay warm on those chilly spring nights with our brand new bonfire, lend your weapons a fiery look with new Fused weapon skins, or change your character’s name! While Angel McCoy has delved into the concept and vision behind the living story within Guild Wars 2, this month we’ve decided to let you in on a few of the driving ideas behind how we’ve approached designing content for a living, breathing world. Defend the innocent from the hybrid threat of the Molten Alliance. 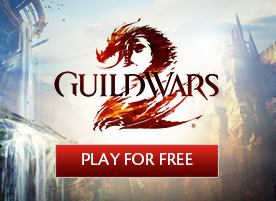 Join the norn Braham and Rox the charr on desperate missions to defend their homelands! Earn new titles and abilities with the new World vs. World progression system, track down three new fugitives in the latest Guild Missions, and more! From now until April 1, you can transfer to worlds with a medium-sized population for free! You’re still restricted to one world transfer per week, so choose wisely. Our team has been hard at work on a new WvW character progression system that will be coming to Guild Wars 2 on March 26. I know a lot of you are curious about what that entails, so I thought I’d go into some more detail about the new system. If you’ve ever played World vs. World in a large group, you’ve probably noticed that there were some enemy players that you couldn’t see. That was an unfortunate side effect of a process called culling. 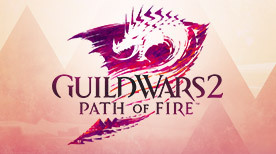 I’m pleased to announce that in the upcoming patch on March 26, we’re going to turn culling off completely in WvW.